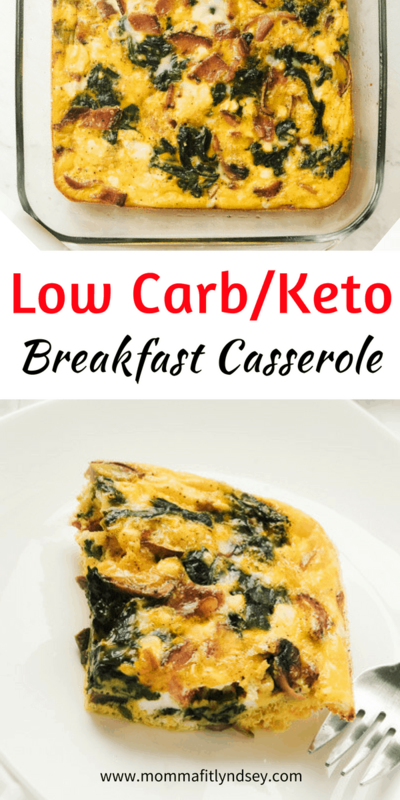 If you’re looking for a filling low carb breakfast, this easy low carb, Keto breakfast casserole will help! Two things can derail me from any healthy eating plan. (1) My meals are not filling enough and (2) they take too long to make or are super complicated. I am completely that person who prints out TONS of new recipes with a bunch of new ideas. What I’ve learned in my three years of being on a healthy lifestyle change is that I need simple. Simple weekday breakfast ideas that require little to no prep are my kind of recipes. 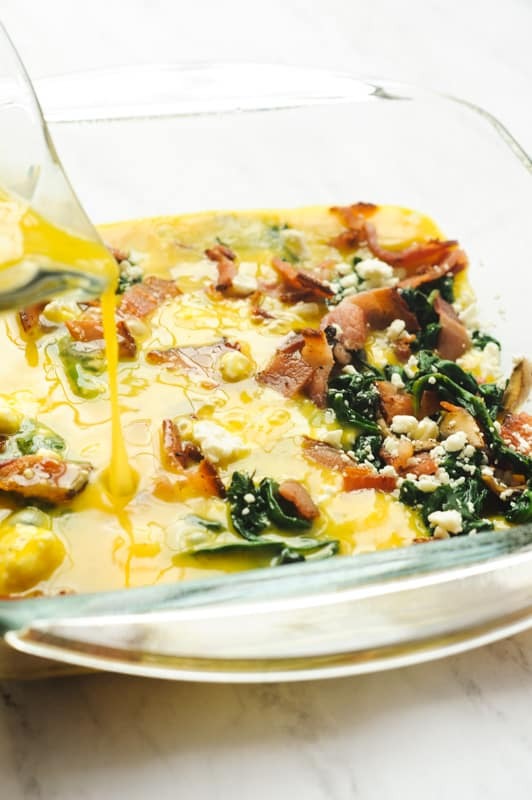 What makes this low carb breakfast casserole fast and easy? Simple ingredients! I like to keep the ingredients to one hand. 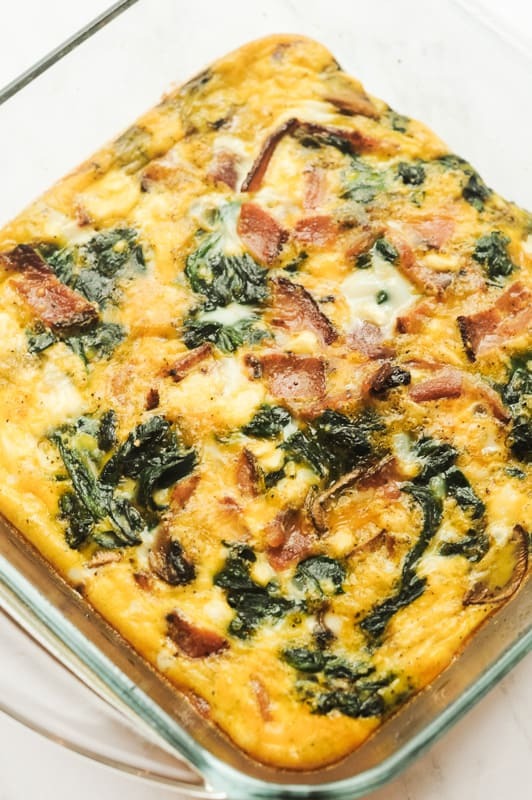 I love the versatility of being able to create your own favorite combination of veggies and meats to make an endless amount of different low carb breakfast casserole ideas. Meat ideas: Bacon, sausage (pork, turkey or chicken), diced turkey, pepperoni, diced chicken. 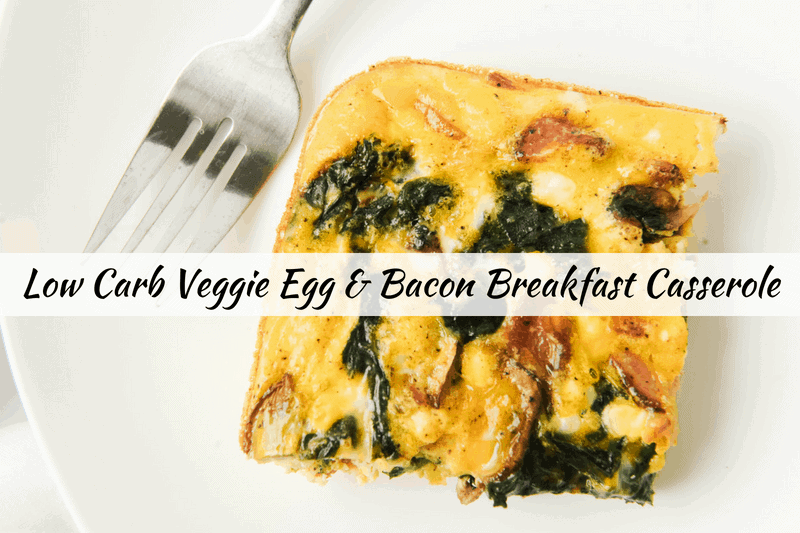 If you’re a veggie lover like me you could add in a bunch of veggies and make this recipe more of a low carb veggie breakfast casserole. Since veggies are good for you, we could still consider this simple with the addition of a few more veggies. If you’re looking to make this casserole paleo-friendly or Whole30 compliant just be sure to eliminate the cheese. 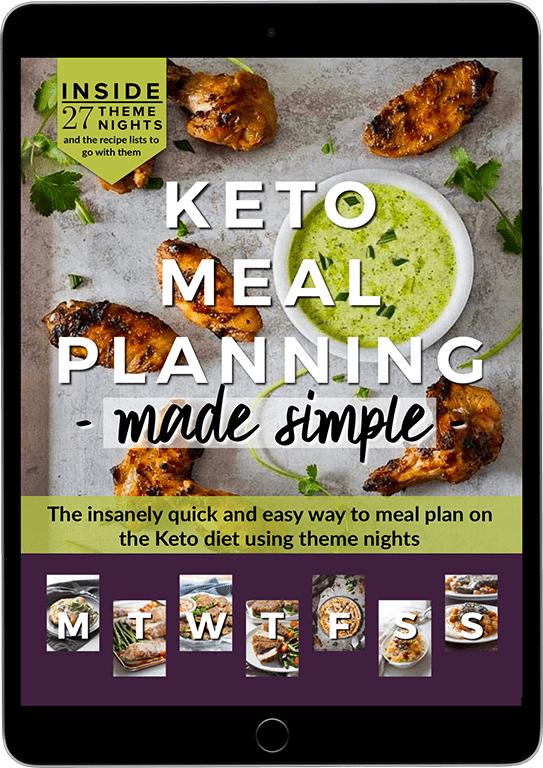 You May Also Like these Other Low Carb and Keto Diet Resources! How I prepped this healthy and easy low carb breakfast casserole for a week of healthy breakfasts! Instead of making an omelette each day, I decided to create a breakfast casserole that is basically one big omelette. It makes it easy to just heat it up in the morning since everything is already cooked. I’ve tried the egg muffin cups before but reheating them always makes them taste like rubber. So I’m sticking with the breakfast casserole! 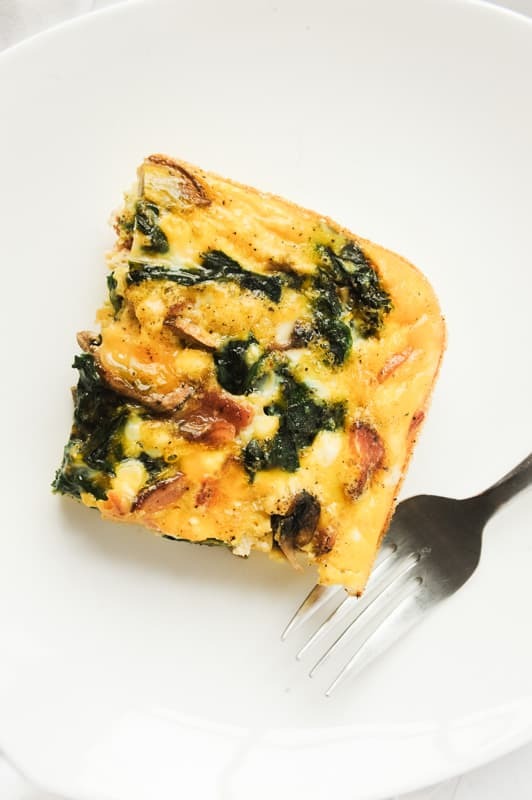 Want a low carb breakfast idea that does not include eggs? How does a low carb bagel sound??? Heavenly is the word you are looking for. What if I’m feeding a crowd? Can I make this for a healthy breakfast for a group? Of course! If I am going to a meeting or something where I need to provide a breakfast for a crowd, I will always try to bring something that is healthy. When you are working on losing weight you always want to plan ahead. 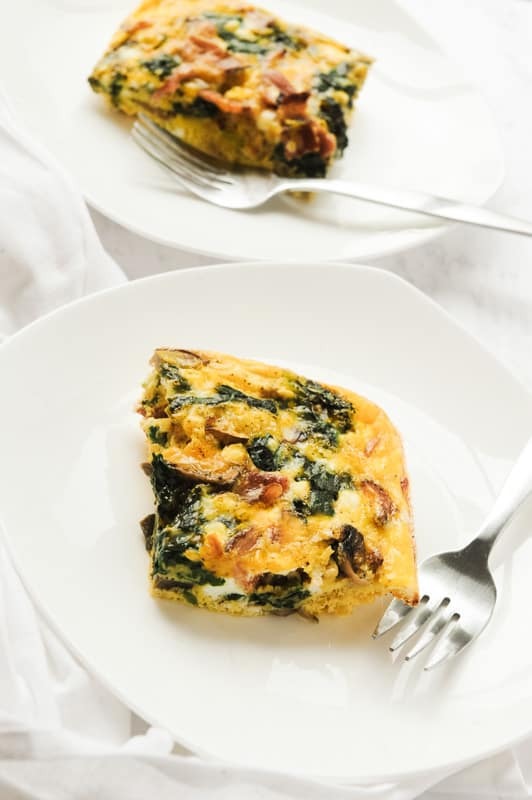 By bringing a low carb breakfast make ahead breakfast casserole you can ensure that you are able to stay on your meal plan and enjoy! Cook bacon on stovetop until desired doneness. Save 2 TB bacon grease. Set bacon aside on paper towels to absorb grease and to cool. 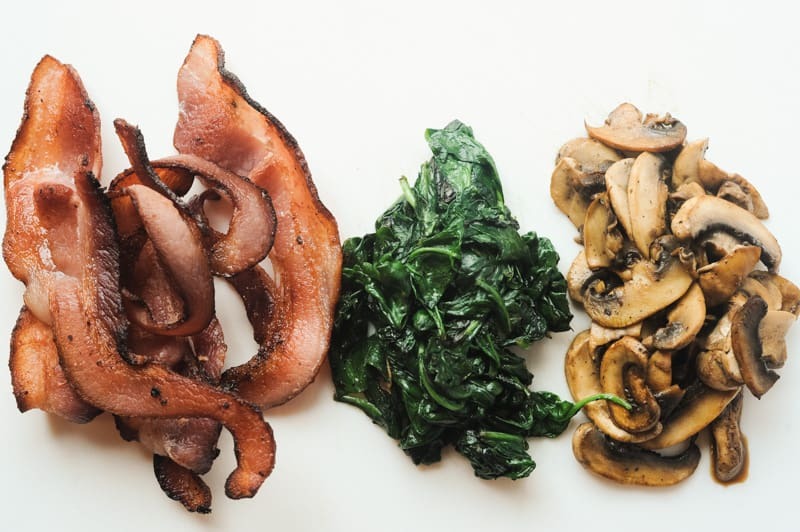 Sautee spinach and sliced mushrooms in bacon grease. Set aside. Chop bacon into small strips. Combine eggs with salt & pepper. Add veggie/bacon mix and feta to a prepared 8x8 baking dish. Pour egg mix over veggie/bacon/cheese mix. Bake in 375 degree oven for 15-20 minutes or until casserole is golden brown and bubbly. Omit cheese for dairy-free, paleo or Whole30 compliant. Are you a big fan of eggs in the morning? What other low carb breakfast ideas without eggs do you like? I’d love to hear your thoughts, or favorite recipes in the comments! Join 20,312 other followers and subscribers in getting more healthy family tips on a budget right to your inbox! Download your FREE Keto Grocery List below! What size container of spinach please? I usually do a plastic container you can get in the produce section. You could also do a box of frozen spinach. Hope that helps!